Punta Cana in the Dominican Republic is a widely known world class golf destination offering many varied courses but ONLY three Oceanside golf courses, Punta Espada at Cap Cana , Corales Golf Club and the 27 holes of La Cana Golf Club located in the Puntacana Resort. 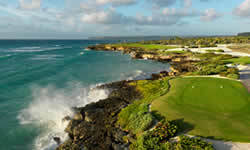 Oceanside Golf is the preferred website and tee time booking agent for Oceanside Golf in Punta Cana. Punta Espada, Corales and La Cana make up the best of Punta Cana Golf and can be packaged in any combination or accessed a la carte. Oceanside Golf guarantees the most convenient booking at the lowest pricing, best service and is inclusive of transportation from all Punta Cana area Hotels and Resorts. If you're a serious golfer you look "Bucket List Courses" and for names like Tom Fazio – Corales Golf Club, PB Dye – La Cana Golf Club and Jack Nicklaus – Punta Espada. Oceanside Golf has all three available for you and has partnered with EZ-Links and the Oceanside courses to insure prompt booking with no restrictions on advance tee times, confirmed guaranteed tee times, packaging and prearranged transportation. That service sets Oceanside Golf apart from all others. Golf tee times are made available to Oceanside Golf in advance 365 days a year and your preferred price includes the round of golf, cart fee, practice range access, golf course amenities and round trip transportation. Group prices are available for sixteen or more players by quote only. Oceanside Golf is the best Punta Cana offers and Oceanside Golf is the service to deliver that golf to the discriminating golfer! Read an article about Punta Cana Golf in Golf Digest, May 2015.